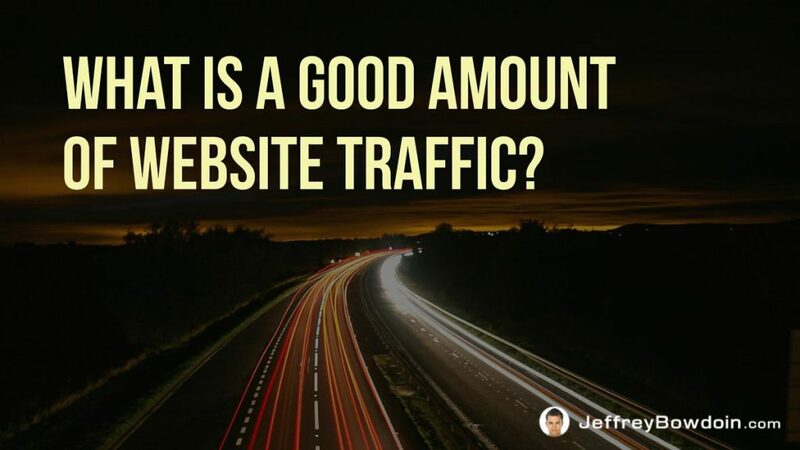 Many people wonder how much website traffic is considered a good amount. Before we answer that, what exactly is traffic? This can be a vague term. We need to define the term traffic before we can have a clear explanation on what is considered a good amount of traffic. There are many ways you can measure and define traffic. There are many ways you can measure traffic. Using a web analytics tool like Google Analytics (GA), you can measure several different aspects of your website traffic. You can measure pageviews, unique visitors, visits, sessions and so forth. Pageviews: Pageviews are the total number of pages viewed. Every time a page loads (or reloads), this is counted as a Pageview. Repeated page views from the same user are also counted. Any page that the user visits, whether it is the same page or several pages, is recorded as a page view. Unique Pageviews: Unique Pageviews is the total amount of pageviews generated by the same user during the same session. For example, it doesn’t matter if a user viewed the page one time or ten times in their first visit, it will get recorded as just one. Whereas with ‘pageviews,’ it would be recorded 10 times if they visited or refreshed a page 10 times. Users (aka Unique Visitors): This used to be called unique visitors until the name changed in GA. Users show how many people viewed your blog (had at least one session on your website). This stat includes both new and returning visitors. Note that to get the true value of unique visitors; you need to look ‘new users’ in GA. Sessions (aka Visits): This used to be called Visits before it changed in GA. A session is a group of actions that the user takes on your website, within a 30-minute window. The group of interactions is recorded for a single user and can be things like pageviews, screen views, transactions, etc. Just as water may be measured in cups, liters or gallons, Traffic can be measured in days, months or years. Many times when people say how much traffic their website gets, they may be very vague in their statement. Do they mean 1 million pageviews or users? Do they mean 1 million in a day, a month or a year? I run sold an eCommerce store that sells vape pens, which I co-founded with a friend (he now runs Front Street Media). We started Slim Vape Pen LLC in 2014. As you can see from the analytics screenshot, it has had about 1 million users. …but that is since its inception in 2014. If I were to tell someone that our website got 1 million hits (which I never would), it would be vague and deceptive. It would sound like the site was getting a million users in a month or a day, which would be a much more popular site. Though our website is no slouch in our niche, some sites do get 1 million users in a month or even per day. There are only about 1,600 websites that get monthly users of 1 million, out of the millions and millions of websites out there. Users per month: How many users per month your site gets. This is also sometimes referred to as unique monthly visitors, unique visitors per month, etc. Users per day: This is how many visits (daily website hits), or unique visits per day your website gets. This is also sometimes referred to as daily website users, website visits per day, etc. Pageviews per day: This is how many pageviews your website gets per day. The point is, you need to be aware of the timeframe when talking about or comparing website traffic, otherwise, you risk being too vague in your statement. How many pageviews per month is good? Website traffic is all relative. In reality, there is no average amount of traffic for all website because it depends largely on the particular niche you are in. Each industry or niche that a website covers can have a typical range of traffic. Though it may be disappointing to measure your own website against others, especially if you are just starting out, it does give you a realistic expectation of the traffic potential you have. A great tool that will help you analyze your site’s traffic to other websites (competitors) traffic, within your niche, is first to google some of your main terms that represent your niche. If you find a few top competitors, you can enter those websites at semrush. Use SEMrush to see organic traffic levels: Though this would obviously be a very competitive niche to get into, you would be able to see comparable website traffic to competitors using SEMrush. One by one, you would want to type in the top competitors in your niche so you can see relative traffic levels. Compare your website with your competitor’s traffic: Semrush is free for its limited usage and gives you some great insights into your competitor’s websites. You can see what your competitor’s website traffic looks like, keywords they rank for, etc. If your website traffic is currently lower than others in your niche, you should never get discouraged by comparing other website traffic to your own. Instead, you should use it as an insight into how you can compete and offer better content over your competitors. Semrush and other competitor research tools can help you gain insight in competitor research and figure out if a niche is worth entering as well. The amount of traffic is not everything. In fact, it can become a vanity measure that, if it does not help accomplish your goals, could be useless. For example, what if your goal was to make $10,000 a month from your website. Say that you have decent traffic, but the items you are trying to sell are not selling very well. Either there is something that is killing the conversions on your blog, or it is a product that your particular niche is not interested in. Serious bloggers focus on goals, not traffic. However, more traffic helps achieve these goals, traffic is not the goal itself. It is a means to an end. Whatever the case is, you need to figure out what your goals are. Do you want to increase exposure of your blog? Then maybe focusing on a whole variety of keywords is what you need to do. Or maybe you need to focus on content that has an appeal to social media exposure and growth. Maybe your goal is to increase profits from your sales. There are a few things right off the bat that you can start doing to increase your profits. Remember that sales are usually a statistical aspect of your total traffic. For example, out of every 100 unique users you get, maybe you can expect to get 3 sales. In this case, it would be a 3% conversion rate (3/100=.03). There are a few things you can do to push those statistics in a positive direction to increase your revenue, and thus profits. High converting keywords: Choosing the highest converting keywords may be a great option to increase conversions and thus profit. You need to find keywords that convert well and are preferably low-hanging fruit, regarding how competitive that keyword is. You can even test keywords (how well they convert) with an AdSense campaign before investing in the content to rank for a chosen set of keywords. Conversion Rate Optimization: Typically it is much easier to optimize your website for increased conversions than it is to create new content to attract new traffic to raise revenue. The effort levels are typically higher, and it takes longer to create new content. However, you should always be doing both, optimizing your site to increase conversions and increasing traffic to the site. Testing prices: I remember back in college sitting in some of my economics classes wondering what the point of elasticity is. Well, now I realize it’s an important concept you can use to increase profits! You don’t have to use fancy economics equations to find the best price point, though. You can do the next best thing – which is to test your pricing. This will give you real world data that doesn’t rely on any economics equations. All you need to do is manually test different price levels and measure which price levels gives you the most profit. You may very well also have several goals that all lead up to the overarching goal of increasing profits. In this case, tracking several things like email opt-in rate, conversion rate, how much people share your content, etc. are all valid goals. However, some of these goals may be more relevant to your primary goal of increasing profit, so it is important to prioritize.